Way back in September we brought you news that TOMY had confirmed that the Sonic Boom toys would be coming to the UK, well several months later, it looks like the merch has landed, or have they? 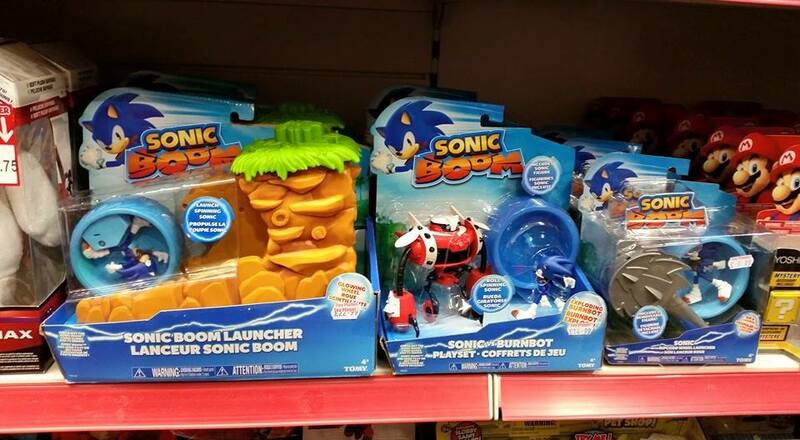 According to this photo, a number of toys from TOMY’s Sonic Boom toyline have made their way into a UK Store, however, all is not as it seems. The toyshop in question is named ‘Toy Planet’ which sounds like an independent toy store, but it’s actually an associate store of the toy shop chain ‘Toymaster.’ What does this mean? Well, Toymaster associate stores in the past have been known to order/import items for ‘test runs’ which may or may not reflect the wider chain of stores. Back when Jazwares released a bunch of 20th anniversary toys, one Toymaster associate store got in some 20th anniversary toys which never saw a wide release in the UK. To further complicate matters, Toymaster doesn’t have an online ordering service, nor does it have a full toy catalogue on it’s website, so trying to verify if this is nation wide isn’t easy. The photo itself was taken from a store in Derby, the person who took the photo also confirmed that the talking plush, running action Sonic and a Knuckles figure were also in stock, the prices break down as follows. Although considering Tomy said that they would appear, it might just be possible that these toys are indeed nation wide here in the UK, you would be best checking your local toy stores just in case they pop up. We’ll update you if we get confirmation that this isn’t just a one off. Oh yes, I remember the Toy Planet in Derby, it’s in that giant loop of the Westfield Centre’s ground floor. Yeah, they get a lot of imported stuff in their stores. Back when I was at Uni, it was where I got like 50% of my Sonic toy merch since the UK stores didn’t have them. I’m kinda in two minds about this, on one hand I want a decent Metal Sonic figurine at last but on the other, alot of the toys looked relatively poor quality compared to other licensed merch and I don’t like the new designs enough to want to decorate my room with them. Don’t get me wrong, I like the new designs, in fact I love Sonics, I just don’t like them THAT much. They’re not very good. Save your money up for a nice F4F statue instead. I meant as a cheaper alternative since F4F is always ridiculously expensive. If you don’t buy a single Sonic Boom toy you’ll have saved up to make a massive dent in any F4F statue. They are expensive, but they’re more satisfying to own. There’s no satisfaction from owning these cheap toys. Some of us are literally incapable of saving up 100s of our money due to bills and life in general. These kinds of toys, therefore, are a much easier and more cost effective way of getting items shaped like our favourite characters. Not buying them won’t save that much since they’ll probably only cost up to 20 (whatever currency) each, 20 which will no doubt go towards the aforementioned expenses instead. Sorry for the unpleasantness, Hog. but on-topic, I saw these in my local Toymaster. Keeping my eyes open for a Sticks figure. Whoops, sorry about that, thought I’d done that. It’s there now.